Kithu Dana Pubuduwa has been instrumental in making the Bible; the Seven Sacraments come alive in our lives. The first step in this renovation project will focus on ‘the stage’ which is from where the Annual Rally is directed. A committee has been appointed to look into the details of the re-building of the stage. It has been decided that the structure will be planned and built based on fulfilling a dire need rather than a show of extravagance. Still for all the cost will be beyond our means if not supported by you. So we make this appeal to you to be a generous contributor to this worthy cause. Click on the album cover image to play. 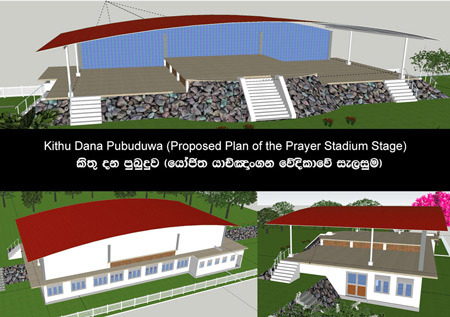 Our MissionMission of Kithu Dana Pubuduwa. The Kithu Dana Pubudwa Community believe the Lord is in this way using each and every one of us to respond to our Christian calling to make Jesus alive in the world through the experiences and testimonies we share whenever we get an opportunity. Contact Us Kithu Dana Pubuduwa [HQ]. Kithu Dana Pubuduwa communities can be found in Sri Lanka, Australia, Italy, Lebanon, Oman, Abu Dhabi and England.